Azure Storage Analytics provides metrics for all storage services, and logs for blobs, queues, and tables. You can use the Azure portal to configure which metrics and logs are recorded for your account, and configure charts that provide visual representations of your metrics data. There are costs associated with examining monitoring data in the Azure portal. For more information, see Storage Analytics. 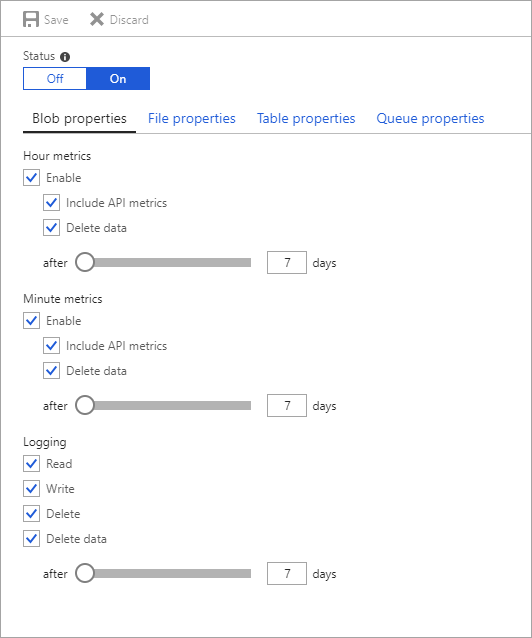 Azure Files currently supports Storage Analytics metrics, but does not yet support logging. In the Azure portal, select Storage accounts, then the storage account name to open the account dashboard. 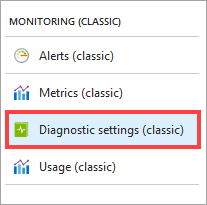 Select Diagnostics in the MONITORING section of the menu blade. Select the type of metrics data for each service you wish to monitor, and the retention policy for the data. You can also disable monitoring by setting Status to Off. To set the data retention policy, move the Retention (days) slider or enter the number of days of data to retain, from 1 to 365. The default for new storage accounts is seven days. If you do not want to set a retention policy, enter zero. If there is no retention policy, it is up to you to delete the monitoring data. You are charged when you manually delete metrics data. Stale analytics data (data older than your retention policy) is deleted by the system at no cost. We recommend setting a retention policy based on how long you want to retain storage analytics data for your account. See Billing on storage metrics for more information. When you finish the monitoring configuration, select Save. A default set of metrics is displayed in charts on the storage account blade, as well as the individual service blades (blob, queue, table, and file). Once you've enabled metrics for a service, it may take up to an hour for data to appear in its charts. You can select Edit on any metric chart to configure which metrics are displayed in the chart. You can disable metrics collection and logging by setting Status to Off. Azure Storage uses table storage to store the metrics for your storage account, and stores the metrics in tables in your account. For more information, see. How metrics are stored. Use the following procedure to choose which storage metrics to view in a metrics chart. Start by displaying a storage metric chart in the Azure portal. You can find charts on the storage account blade and in the Metrics blade for an individual service (blob, queue, table, file). Click anywhere within the chart to edit the chart. Select the individual metrics you'd like displayed in the chart, then click OK. Your chart settings do not affect the collection, aggregation, or storage of monitoring data in the storage account. Aggregate monitoring provides metrics such as ingress/egress, availability, latency, and success percentages. These metrics are aggregated from the blob, table, file, and queue services. Per API provides finer resolution, with metrics available for individual storage operations, in addition to the service-level aggregates. You can create alerts to notify you when thresholds have been reached for storage resource metrics. To open the Alert rules blade, scroll down to the MONITORING section of the Menu blade and select Alerts (classic). Enter a Name and Description for your new alert rule. Select the Metric for which you'd like to add an alert, an alert Condition, and a Threshold. The threshold unit type changes depending on the metric you've chosen. For example, "count" is the unit type for ContainerCount, while the unit for the PercentNetworkError metric is a percentage. Select the Period. Metrics that reach or exceed the Threshold within the period trigger an alert. (Optional) Configure Email and Webhook notifications. 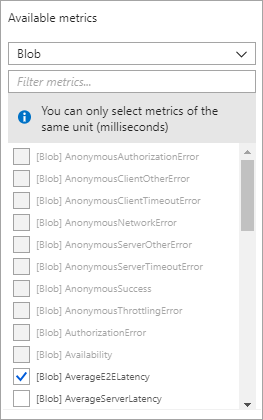 For more information on webhooks, see Configure a webhook on an Azure metric alert. If you do not configure email or webhook notifications, alerts will appear only in the Azure portal. You can add Azure Storage metrics charts for any of your storage accounts to your portal dashboard. Select click Edit dashboard while viewing your dashboard in the Azure portal. In the Tile Gallery, select Find tiles by > Type. Select Type > Storage accounts. In Resources, select the storage account whose metrics you wish to add to the dashboard. Drag-and-drop the chart tile onto your dashboard for the metric you'd like displayed. Repeat for all metrics you'd like displayed on the dashboard. In the following image, the "Blobs - Total requests" chart is highlighted as an example, but all the charts are available for placement on your dashboard. Select Done customizing near the top of the dashboard when you're done adding charts. Once you've added charts to your dashboard, you can further customize them as described in Customize metrics charts. 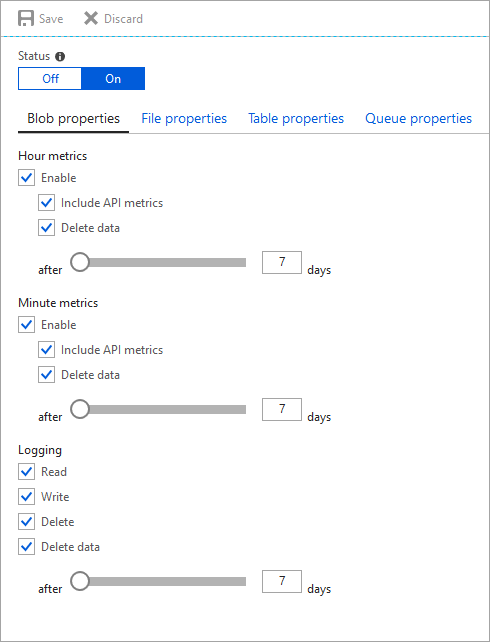 You can instruct Azure Storage to save diagnostics logs for read, write, and delete requests for the blob, table, and queue services. The data retention policy you set also applies to these logs. In the Azure portal, select Storage accounts, then the name of the storage account to open the storage account blade. Ensure Status is set to On, and select the services for which you'd like to enable logging. The diagnostics logs are saved in a blob container named $logs in your storage account. You can view the log data using a storage explorer like the Microsoft Storage Explorer, or programmatically using the storage client library or PowerShell. For information about accessing the $logs container, see Storage analytics logging. Find more details about metrics, logging, and billing for Storage Analytics.